The Becoming a Certified Solidworks Associate for Beginners course, is originally, a 30-hour instructor led training programme, that has been converted into a self-paced learning course, with the objective of making it Affordable, Accessible, and Value-Adding to learners. This course is developed and taught by Chevy Kok, a Certified SolidWorks Instructor, who has directly trained and certified hundreds of students, in physical, instructor-led courses. You have the guarantee that you are learning from the best in the field! Access course materials on course website, or via iOS and Android apps. Course is closed captioned (CC) for added clarity in delivery. Blend of video instructions, quiz questions, and hands-on practice exercises. Access to the Certified SolidWorks Associate (CSWA) preparation course. Understand best practices from the best in 3D design. Learn on the latest version of the SolidWorks 2015 software. Periodic course updates with design projects. Over 40 lectures and 6 hours of content! Understand how to create 2D sketches, and fully define them with dimensions and sketch relations. Create multi-feature parts with Extruded and Fillet features. Create axissymetric parts with Revolved and Chamfer features. Create free-form geometry with Lofted features. Create model geometry with Swept features. Create repeatable and symmetrical models with Patterns and Mirror. Understand Bottom-Up Assembly process and constrain assembly components with mates. Evaluate assemblies and modify/edit designs. Create Exploded View of Assemblies. Understand angles of projection and 2D Drawings creation. Create different types of drawing views, and insert specialized annotations in detailing of drawings. Create assembly drawings with bill of materials, balloons, and assembly sections. For mobile learning, a Tablet of Smartphone with compatible web browser (Chrome & Safari). If you are looking to get your CSWA and would like a course to help you with your endeavor, then look no further. This course is for you! The instructor gives you step by step instruction and tells you exactly what to expect on your exam. Files are downloadable to help speed up your learning but he walks you through a lot of them to help you get the hang of drawing parts. The production quality was pretty good. The only thing I would say is that sometimes the words for the tools or in the Feature Manager Tree were a little blurry but other than that, the sound quality was great, the instructor knows his stuff and it was a great learning experience. If you’re serious about getting your CSWA, take this course! It was a really good course with very clear explanations. Ideal for beginners. It would be better put downloadable parts for older version of SW also. But thumbs up! I had been using Solidworks for a few years when I took this course. My goal was to learn some techniques to make me faster and more productive. I found that each of the sections in the lesson had one or two things that I didn’t know about and that will help me out. Overall, I found the course to be well laid out, in a logical sequence. Chevy speaks in a measured way, and is obviously enthusiastic about Solidworks. The course is done professionally, and has high production values. The only problem that I had was that I was unable to load the example files, due to the fact that they were created in Solidworks 2015 and I was using 2014. Many of the files used later in the lessons are created by the student in earlier lessons. Chevy mentioned that PFDs of the dimensioned parts were available for download, but I didn’t see any in the available files. The downloads are hooked to the lectures and can’t be downloaded all at once, so I may have missed them. Thanks for a great course, Chevy! This course is very well organized. Instructor’s teaching style and quality of teaching is A plus. 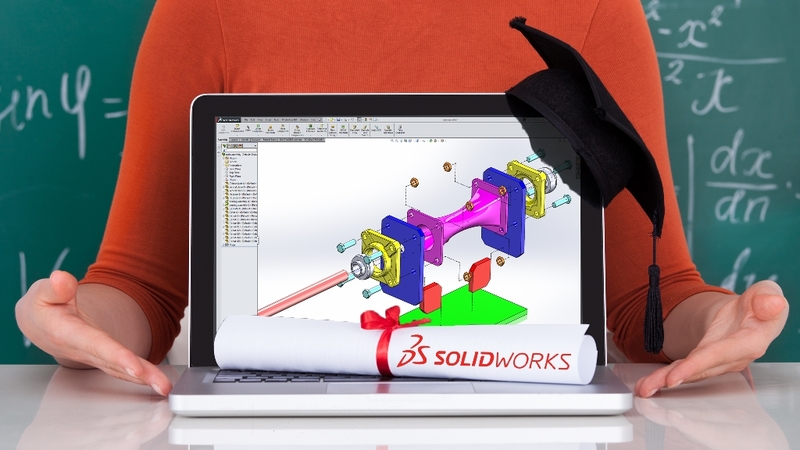 This six hour course will give you a clear understanding of SolidWorks software. It will definitely help for CSWA exam preparation. A little bit more example parts for the exam preparation will help. If possible some pdfs for the drawing content may be helpful. Many many thanks to MR. CHEVY KOK. This is a great course which teaches basic and intermediate level computer CAD drawing skills. I found the pace slow as i already learnt some basics CAD skills, but i believe beginners will find the pace just right. The duration of the lessons were kept to small, bite-sized chunks which i liked. One improvement would be useful is to have a speed control setting for the lectures to slow down/speed up the course. Fantastic Course, Really for Beginners. The content of the course was very simply explained, with good video demonstrations to guide us through. There were corresponding files uploaded with the lectures, which we can download and mirror the lecturer’s actions! All techniques needed for the CSWA were taught in this relatively short and comprehensive course. I’m a student whom just completed my undergraduate course in IT. For me, any course must have a highly knowledgeable teacher who can motivate his or her student to excel. As such, the course instructor who is an expert in this field have put together a highly beneficial course who may want to take the CAD/CAM path as their carrier. I have learned a lot within a short period of time regarding SolidWorks. Also, the selfpac3d challenge is also a real motivator. I hope Mr. Kok will do the challenge frequently. I also would recommend this course to IT students like me. This is a well structured course. The teacher (Chevy kok) have a good skill in teaching Solid Works and you can see he enjoys teaching. I am very happy. Thanks. Wanted to learn Solidworks for years and this was the perfect launching platform. Have already done some designs on my own, even advanced projects with information contained within this course. Thanks Chevy! I enjoyed this course, very clear and easy to underststand, the tutor explains very useful topics!!! Extremely precise, detailed and to the point lectures. Very methodical. One of the best courses I have taken (if not the best)!! Excellent course. Learned a lot.